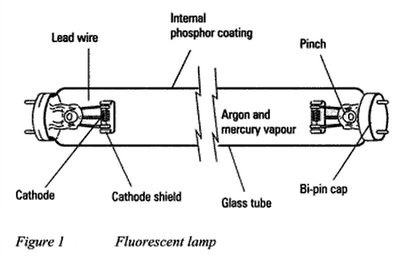 Low pressure mercury vapor lamps are better known as FLUORESCENT LAMPS and they use the effect of phosphorescence to produce light. Two cathode filaments coated with electron emissive material are sealed into a glass tube which contains gases such as argon and krypton with a small quantity of liquid mercury, creating a low pressure region. The inside wall of the lamp is phosphor coated to produce the desired colour of light (for example, white, warm white and coolwhite)(Figure 1). When the supply voltage is switched on the flow of current causes the cathode filament to increase in temperature and emit electrons. The negatively charged electrons are then accelerated along the lamp by the high voltage produced by the action of the chock (inductor). The electrical discharge produced generates a considerable portion of ultraviolet energy with a small amount of blue light. 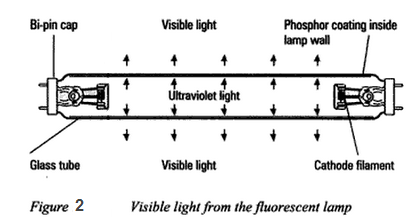 By the action of phosphorescence the phosphor coating converts the ultraviolet energy into useful visible light from the lamp wall (Figure 2). Difference types of phosphor will emit light at different wavelengths (colour), consequently the mixture used will dictate the colour requirements of the lamp. The introduction of the triphosphor fluorescent lamp, which is internally coated with a mixture of red, green and blue phosphors, has significantly increased the lamp efficacy while having good colour rendering properties. 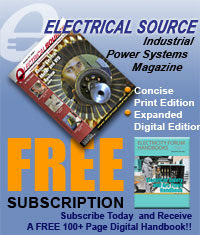 Most discharge lamps requires a higher voltage than the normal 230 V mains supply to initiate the discharge. 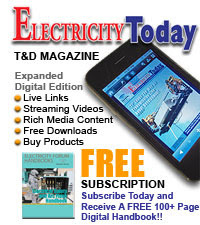 The following circuit diagrams illustrates how this is achieved for fluorescent lamps.